Time for Three is a self-described “classically trained garage band” that originally got its start at the Curtis Institute of Music in Philadelphia when three guys just started playing their instruments together for kicks. The story that’s often told is how a couple of them were playing with the Philadelphia Orchestra when a lightning strike killed all the electricity, so they started an impromptu jam session in the dark that thoroughly entertained the audience. 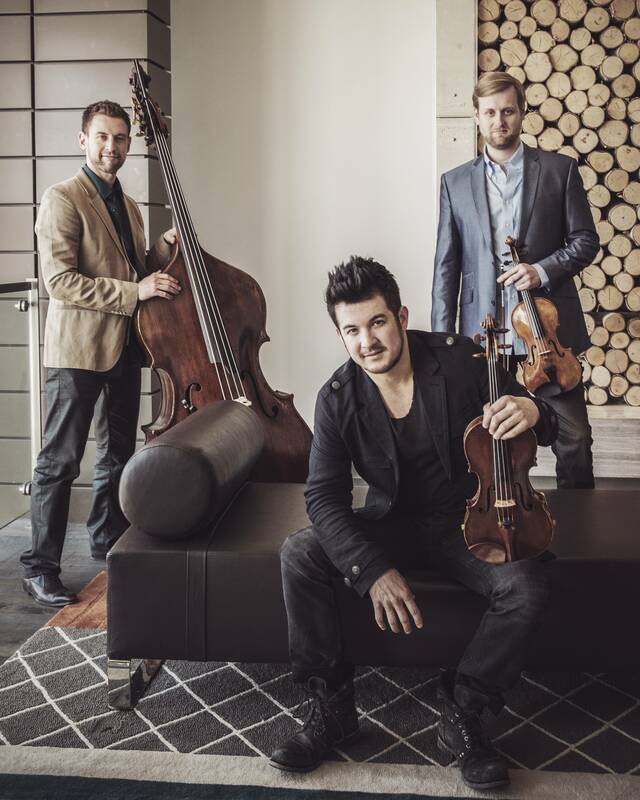 From there, they started playing out as a trio and even now have compositions written explicitly for them, such as the Concerto 4-3 by composer Jennifer Higdon. 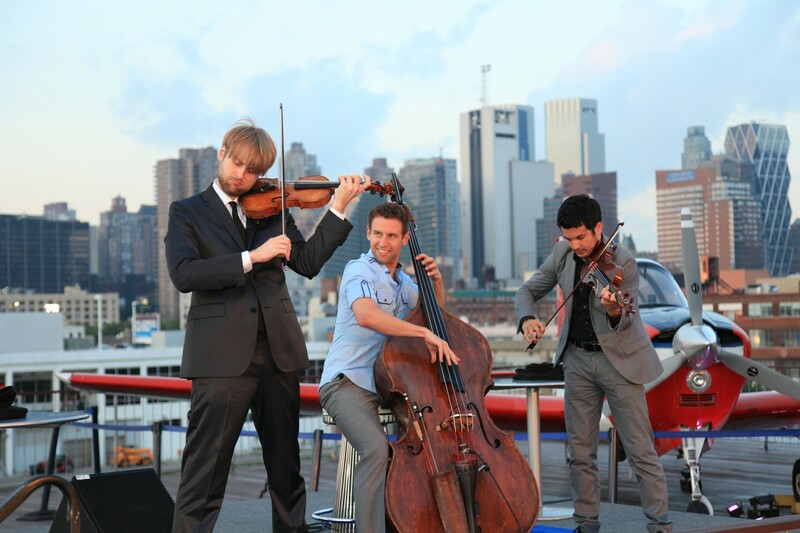 The musicians making up this trio are Nick Kendall and Zach De Pue on the violin and Ranaan Meyer on the double bass. About the tag line “classically trained garage band”. We take our music very seriously, but the way we put it together and the attitude on stage is just very raw, visceral. It’s more about the interplay between the personalities. It has that kind of untamed edge to it. Time for Three were here in Columbus, OH last spring when they played at a fundraising event for ProMusica Chamber Orchestra. I remember being awed by some of their music played during an interview that morning on Classical 101. Over the summer, it was also this ensemble that got held up by United Airlines because their violins were apparently deemed a danger on the flight and they were told to check them or not board. They obviously chose not to board. Zachary de Pue (an Ohio native as well as Concertmaster of the Indianapolis Symphony Orchestra) and Nick Kendell protested via social media (Check out the video on my earlier post, Irony) and created yet another stir with the airline industry’s way of handling precious and quite valuable musical instruments. As a trio, they’ve released 4 albums thus far including their latest self-titled album, Time for Three (2014). The whole album is a blend of classical and folk music with some guest vocalists mixed in for fun. The album includes songs with some vocals mixed in such as Happy Day, Winter, Everything’ll Be Alright and Danny Boy – played in a more traditional 3/4 time with a vocal duet. They have a great take on the traditional tune Norwegian Wood as well. Don’t know it by name? When you hear it, it’ll sound familiar. I promise. Banjo Love and Queen of Voodoo are awesome. When you think of a banjo, you think of blue grass music and Banjo Love doesn’t disappoint. Queen of Voodoo invokes a hint of zydeco as well as plenty of jazz which is rather appropriate considering it features Branford Marsalis on the saxophone. My favorites are those with more of a classical feel to them such as Chaconne in Winter. I can’t get enough of it. Really. I’m happy with just track 11. Have you ever had a song you liked so much that you could listen to it over and over again? Have you ever had a song you liked so much that you actually did listen to it over and over again? I’ve listened to Chaconne in Winter so many times in a row now that I feel I could almost play it. Mind you, I don’t play the violin. I’ve never even held a violin. Heck – I’ve never even touched one, but the notes are played wicked fast and the harmony between the two violins combined with the steady lines in the bass come across with such a crazed intensity that you can’t help but replay it. Again. And again. And again. I picture this song as one that would serve as that initial inspiration that prompts a young kid to start playing an instrument and thus opens him (or her!) up to a lifetime of music. I can’t stop listening to this. Honest. If you want something fun that has a huge and modern variety of music styles, you should really pick up this CD. Time for Three is awesome – they’re so talented. Trust me. You’ll thank me later. Want to learn more? Find Time for Three on Facebook or follow them on Twitter. Tags: Classical Music, Review, String Trio, Time for Three, Trio. Bookmark the permalink.